Over the years, I’ve received many e-mails from people desperate for the opportunity to view the opening credits to the NBC Saturday Night at the Movies. Specifically, the second version of the credits introduced in the mid-1960s and used until 1972. Audio of the opening credits has been available online for years but video has been elusive. This particular opening credits sequence is for the 1967 movie The War Wagon starring John Wayne and Kirk Douglas. I grew up in an area surrounded by hills, so the local NBC station was the only channel that came in at our house. 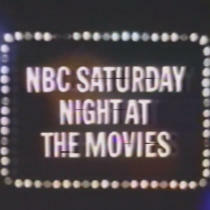 Watching NBC Saturday Night at the Movies was a big part of my growing-up years. I didn’t realize how important it was until seeing and hearing this opening. Now I want to hear the timpani(?) roll that accompanied station breaks. It was commonplace for local announcers to promote movies and shows for the station, at least during the day. Usually these announcers were the local station’s news reporters.It may be that some local stations replaced or re-recorded the intros. Does anyone know when this particular movie originally aired on NBC? I thought this opening went all the way back to 1961 with one exception: In the on-screen title, the network’s name originally wasn’t included, with the films simply broadcast as “Saturday Night At The Movies” and not “NBC Saturday Night At The Movies”. And this movie aired on NBC Saturday Night at the Movies in 1972.